“As a young boy from Bogota, Colombia who grew up in the United States, I found it hard to connect with my community and roots during my teen years. I had very few memories of Colombia and my once-distinct Spanish accent was no longer prominent,” notes Antonio Pulgarin. It was Pulgarin’s effort to reconnect with roots that drove him to create his Latin American Fotografia-winning series “Tierra del Olvido/Land Forgotten,” which features a striking image of a silhouetted family matriarch—an image that in fact is not what it appears to be. The "Tierra Del Olvido/Land Forgotten" series focuses on several themes, such as the construct of identity, family, and religion. Growing up distanced from Colombian culture, Pulgarin says, “left me wondering who I was in a sense. This stuck with me throughout my teen years and into my time at the School of Visual Arts.” It was at SVA that Pulgarin decided to create a body of work that addressed the idea of identity from his own perspective. Pulgarin’s LAF-winning work centers on the matriarch of his own family, his mother. “My mother and I had an unstable relationship, and through this image I mimic her demeanor as a means of trying to connect with her on an emotional level,” he says. 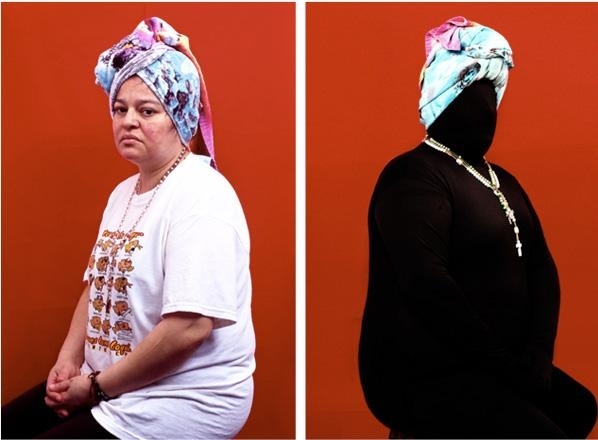 “I am also stating that no matter how much I try, I never seem to connect with her—a fact symbolized by the black body suit that I wear in the photograph. There is a disconnect between mother and son.” A red silk cloth that Pulgarin found in a fabric shop in his old neighborhood, the Wyckoff Gardens housing projects in Brooklyn, provided the background for the photographs, which were taken in his mother’s kitchen with a simple two-light setup and a Nikon F100 SLR loaded with color slide film. “It was a rather difficult photograph to take, but in the end it all came together,” says Pulgarin. Since graduating from SVA last year, Pulgarin has gone back to his old neighborhood, which, he says, has undergone a profound change with the construction of hotels, condominiums, and commercial buildings. “This served as inspiration for a new body of work titled "...And Then There Was Us,” which explores the individuals remaining in the Wyckoff housing projects as the surrounding area continues to gentrify,” he says.